Do you Need A Case and Screen Protector for Your iPad? I totally understand that you’ve just dropped hundreds or even thousands (I’m looking at you, iPad Pro) of dollars on a new iPad and you are feeling a little nervous about keeping it pristine. The market has noticed too, and a huge industry has sprung up to cater to our vanity and paranoia. There’s a full spread of products available, ranging from very cheap to stupidly expensive. The question is: Are any of these worth it? That’s exactly what I’m going to address here, and hopefully by the end you’ll have a clear idea of whether these accessories are for you. Screen protectors. Man, oh man, people will fight over this issue. First off, a screen protector is not a case or a cover, it’s a clear sheet of protective material that is applied directly to your tablet’s touch screen. The idea is that this will protect it from getting all scratch up during normal use. Do they do this? For the most part, yes. But there are some serious drawbacks to having a screen protector that may make you think twice about the perceived extra protection. The first problem that I have with screen protectors is that they are a real pain to install. If you think it’s tricky to get a bubble-free installation of a screen protector on a tiny iPhone screen, wait until you’ve tried putting it on a 9.7” screen or (the horror) the big iPad Pro. I’m a little OCD about this sort of thing and unless the screen protector is perfectly square and is applied flat and even it will irritate me so much that I have to take it off. The other problem is that it changes the texture of the screen, which wouldn’t matter if this wasn’t your main way of interacting with software. The fact is that there is no screen protector that matches the quality of the Corning glass that your iPad comes with. No matter which way you look at it, this is an objective downgrade from leaving the screen bare. The most important thing is, of course, the scratch protection. Let me say that I am against putting screen protectors on both phones and tablets simply because it makes no sense to me. Why pay around a thousand dollars for a device that has the most advanced oil and scratch-resistant glass known to humanity in it, and then stick a plastic or even glass screen protector on it that costs only a few bucks? In the early days this would have been sensible, since the screens on early mobile devices were super fragile. I have the remains of a broken iPaq and Palm Pilot to prove it. Fast forward to the present day and you’ll have no trouble finding videos of people that try to scratch up various devices with hard metal objects, with no effect. This makes sense, since the glass is harder than any metal it may encounter, such as car keys. Now, things like concrete and hard minerals such as with rocks WILL scratch your screen, but in those situations you have usually dropped the phone, which means that an impact is more likely to shatter or otherwise damage the screen. Screen protectors don’t offer impact protection, so the point is moot. The pointlessness of screen protectors is especially pronounced when it comes to iPads, especially since most people use a magnetic smart cover, which completely covers the iPad when not in use. Normal day-to-day use won’t mess with your screen, and weird abnormal accidents should be covered by your insurance – something you should have on a thousand dollar mobile item. Covers are not so clear-cut to me. I’m a big fan of the magnetic smart cover that modern iPads use, mostly because it makes my iPad more useful. It doubles as a stand, it provides a way to quickly check notifications, and it doesn’t make my iPad fatter or more cumbersome. Any screen protection that the smart cover provides is incidental in my view. I also don’t really have a problem with silicon skins, since some people may prefer the grippier texture and measure of drop protection. The metal that iPads are made of is quite soft, so a drop onto a hard surface may dent or deform it; a silicon skin may help with that. Once again, it doesn’t make the iPad significantly thicker or heavier. Full-size hard covers? No. Just no. Unless you want to get a ruggedized case or cover for special use cases like offroad, outdoors, or wet weather-type stuff, this is just a way to soothe your paranoia and ruin the beautiful design of an expensive and advanced electronic device. So do you really need a screen protector and case? That’s a different question from whether you want one or not. If you want something just because you want it, that’s perfectly OK. You don’t even have to read any further. It’s your money and it would be presumptuous to judge the way you choose to spend it. In terms of need? Not really. For most people’s normal daily use pattern, a screen protector is just a waste of ten bucks. It’s much the same for cases. Apart from the screen, the body of your device will pick up scratches over its life. No matter how much stuff you put onto it, wear and tear are inevitable. So if some sort of OCD is driving you to stick stuff on your iPad maybe you should just let it go and accept it. The way I see it there are a few general rules that will help you decide if a screen protector, case, and cover are for you. First, what does “normal use” mean in your specific case? 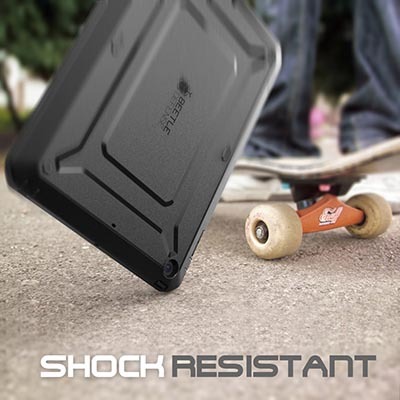 If you work on a construction site or some other risky environment, then maybe a cumbersome case or protector is a good idea, since the odds of truly serious damage happening to your iPad is not so remote. If you spend your days in an office and your iPad travels only from hand to bag, maybe it’s not worth the inconvenience. Second, does the accessory make your iPad less pleasant to use? If so, is it worth the safety trade off? Third, does the accessory add functionality? For example, the smart cover doubles as a stand and doesn’t really lessen the experience of using an iPad. Fourth, if the worst does happen and your iPad is badly damaged, what then? Do you have insurance? Would the cost bother you? Is the daily hassle of a case worth the rare hassle of repair or replacement? There is no one right answer for everyone. Your situation is unique and so must your solutions be, but consider WHY you want to accessorize with costly protective products and think about if you are doing it for the right reasons. Otherwise you may be wasting your money and not getting the full enjoyment out of your iPad.